Those are just a few reasons why you should consider looking into using olive oil based beauty products for your skin. They are wonderful! Today, I am going to introduce you to a company that carries wonderful, all natural skin care products from Italy...the main ingredient is, of course, olive oil! 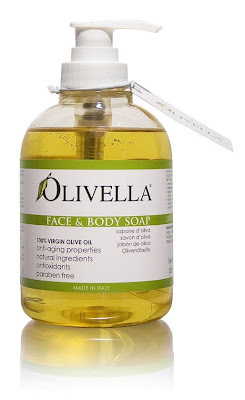 Olivella provides us with soaps, lotions, shower gels, fragrances and other olive oil based beauty essentials. Olivella is a complete body & skin care line made with 100% Virgin Olive Oil from Italy, created for all the family, and gentle for a baby's skin too! !Olivella is a work of nature thanks to its All Natural 100% Premium Virgin Olive Oil ingredient from Italy.By using Olivella products, you will experience a centuries- old natural skin care tradition using all the active principles contained in Virgin Olive Oil, considered a true gift from the Gods since the early Greeks and Roman civilizations.Olivella products offer rich nutrients found in Virgin Olive Oil that helps protect the skin against the impact of damaging free radicals and harsh environment conditions, such as light smog, pollution and extreme temperature changes.Olivella is rich in antioxidants Vitamin A and E, contains anti-aging properties and bioactive substances that stimulate and smooth the connective tissue to combat the first signs of skin aging. If you were to take a look at lot of skin care products on the market today, I am sure you would be shocked at some of the ingredients. As I have said in the past, I hate staring at an ingredient list trying to decipher the names of what is actually in the product. It just isn't fun. So, I welcome natural products like the ones found at Olivella...because I KNOW what is in them! For this review I was sent several samples of their products, along with a full-sized bottle of Olivella Virgin Olive Oil Liquid Hand Soap. When my box came in I could already smell the lovely soap as I think there was some spillage in the box (not from my shipment but possibly from something that had shipped in the box prior). I could not wait to try out this soap!! The soap is very mild in scent and kind of reminds me of a citrus/clean scent. It is not extremely bubbly and feels very gentle on the skin. After using it my hands felt soft and clean and it did not dry my skin at all. A few minutes later I tried the sample packet of the Olivella Virgin Olive Oil Hand Cream. This cream is also very light and is a pale green color (from natural chlorophyll). It felt SO nice! I applied some to my daughter's hands as well (she loves to wear lotion a.k.a "ocean" as she calls it) and she love it as well! I will be very interested to see how her eczema reacts to this cream...she has it pretty badly on the insides of her elbows and on her wrists and when she applied it to the effected areas, it did not cause her any pain. So, this may be a good thing for her skin too! All of Olivella's products are Paraben free, colorant free, contain no animal ingredients and no animal fat and are certified Kosher by Orthodox Union. I love how clean and natural these products are!! The Olivella Virgin Olive Oil Hand Cream retails for $10.50/tube or you can purchase a pack of 3 for only $27.00. The Olivella Virgin Olive Oil Hand Soap retails at $10.50/bottle and you can also purchase a multi-pack of 6 bottles for $57.00. These prices are not bad considering you are getting such wonderful and natural products. If you would like to try out their products, you can check out their website for special offers, or you can purchase two products and get one free by clicking HERE! So, in my opinion...Olivella is a wonderful company! I am especially loving the Liquid Hand soap and find it very gentle on my sensitive skin. My daughter and I both enjoyed the Hand Cream and would definitely recommend it to anyone with skin issues or just dry and chapped skin. It is very soothing to use. This whole company is truly wonderful...full of lovely products that are just waiting for you to try! Visit them today and see what they have to offer you. Disclaimer: I received no monetary compensation for this post. I did receive Olivella Products for review purposes. All quotes and stock photos are from the Olivella website and email. All thoughts and opinions are 100% mine. These sound like they'd work great for my dry skin! Thanks for sharing! I recently tried an olive oil face wash and really liked it. I'm interested in learning more about this line! Looks wonderful! I especially like the absence of harmful chemicals. That looks wonderful! I agree with you about olive oil being so much better for cooking and baking. It makes sense that it would be great on your skin as well. I have heard wonderful things about this product! Thanks for the review. These sound like some fantastic products. My hands are always super dry, so the hand cream is something I'm interested in. Thanks for sharing! I have never cooked with Olive Oil before. I want to give it a try! Thanks for this post!! I agree that olive oil is so much better for cooking than vegetable but I've never thought of using it on my skin.. Thanks for sharing! I've never heard of Olivella before. Their products sound wonderful! These look amazing, I have made some of my own homemade products using olive oil before and they have been pretty awesome! The hand cream sounds amazing!! I have horribly dry skin, so this could be perfect for me! I love Olivella! You guys must try thr anti-wrinkle cream.. It's so good!